About 175 members of the campus community gathered Friday for the official dedication of Maximino Martinez Commons, UC Berkeley’s newest student-housing facility. The ceremony was held on the building’s east plaza, and was followed by a reception inside its spacious, light-filled lobby. Located at 2520 Channing Way, Martinez Commons opened its doors in mid-August, when more than 400 students, most of them sophomores, took up residence in the modern six-story facility built to LEED Gold sustainability standards. 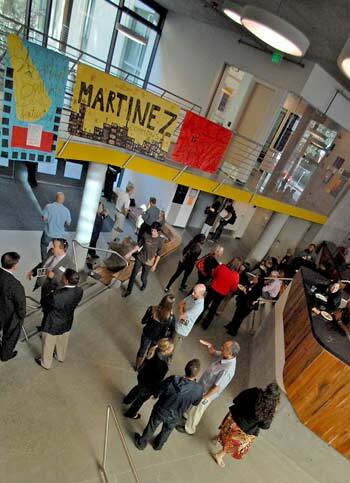 The commons is named in memory of Max Martinez, a longtime and much-beloved Berkeley staff member, who dedicated his career to helping students, particularly the underprivileged. “Max was an ordinary guy with an extraordinary vision,” said one the speakers, the Rev. Randall Roth, a friend of the Martinez family. Martinez Commons includes 201 beds in double rooms, as well as 215 single-occupancy units. It features accessible bedrooms and units for the hearing-impaired, as well as a faculty apartment, study rooms, an academic center and a fitness center. Among its many sustainable features are storage space for more than 80 bicycles, an energy dashboard that displays energy and water use in real time, rooftop solar collectors for water heating, 20 tons of wood (used for benches, paneling, etc.) from trees cleared from the site, as well as drought-tolerant native-plant landscaping. See video of the dedication here.